FOUR Border Collies owned by Mr J. W. L. McKee from Hillsborough won seven trophies, seven firsts and seven second prizes at the sheepdog trials in July 1958. The trials had taken place at Bangor where Don, Lad, Snip and Nan gained success. When Snip won the Irish Championship, she had beaten Moss owned by Mr J. H. Holliday from Yorkshire, which meant it was the first time an Irish dog had beaten the winner of an international championship. AN EAR, nose and throat consultant was to be employed in November 1958 at the Lagan Valley Hospital. Captain W Hawthorne, the secretary who had reported to the South Antrim Hospital Management Committee at the time that he had discussed with senior officers of the Northern Ireland Hospitals Academy ways to improve the ear, nose and throat service. The South Antrim Hospital agreed to employ an additional consultant who would have done one out-patients' and one operating session a week in the Lagan Valley Hospital. Mrs. Sarah Crothers presenting a ten year savings certificate to Mrs. E. McAllister, secretary of Ballymacrickett Primary School saving group in February, 1971. Looking on are the pupils with Mr T. Harvey, Miss B. Devlin, vice-principal and Mr. Jim McCann, principal. IN June 1977, Warren Boys had set off for Wantage in Oxfordshire to compete in a six-a-side football tournament. The Borough Council sent good wishes to the boys and their leader Mr James Wilson, and Alderman Mrs. Elsie Kelsey had provided a Borough Heraldic Shield, which was to be presented by the team while in England. Warren Boys were to compete in the under 12 section of the tournament organised by the National Association of Boys' Clubs. IN 1958 one of the then modern and 'up-to-date' butchers' shops in the UK was to be opened with much excitement. The shop was going to be opened in Lisburn and was run by 'Messrs Cromie' the well-known Belfast meat firm in the former chemists shop of Mrs. Chambers at Market Square. Alterations were made to the shop and Mr Cromie said the shop would be the finest in the UK and would stock the highest quality meats for wholesale and trade. LISBURN'S problems of litter, pot-holed roads and unsightly security barrels were being tackled with new vigour in June 1977 after the town finished at the bottom of the 'Best Kept Town' league. The front page story of the Star reported Lisburn Borough Councillors were aiming to lift the town from that unenviable position and give the borough an image in keeping with its status as the fastest growth area in Ulster. The main priority was the question of the battered security barrels, with suggestions that they were to be removed or substituted with flower containers. Councillor Alec Boyd said: "The yellow, rusting barrels which decorate the centre of Lisburn would not look out of place in a derelict shanty town. They certainly do not add to the public image of Lisburn, and the lack of litter bins encourages rubbish to be strewn around the town." He recommended that the barrels be replaced with flower containers. 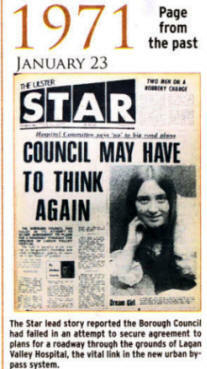 It was agreed litter bins were to be provided and emptied regularly; all the Council property within the town was to be painted and cleaned up; skips were to be provided in suitable places throughout the Borough and emptied regularly. Alderman William Belshaw voiced his concerns about the number of posters in the town, Councillor Seamus Close called for graffiti to be removed from the walls, and Alderman John Cousins asked that the Roads Service of the Department of Environment be called upon to take action with regard to the state of Lisburn's roads. The Council decided that a special meeting would be called to discuss the matter in depth and draw up definite plans for improvements. 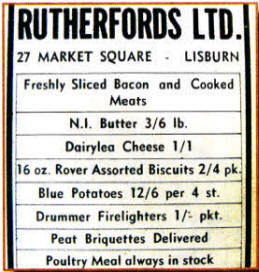 The Star advertised some tasty bargins back in 1971 from Rutherfords in Market Square. The Star lead story reported the Borough Council had failed in an attempt to secure agreement to plans for a roadway through the grounds of Lagan Valley Hospital, the vital link in the new urban bypass system. THE Northern Ireland General Health Services Board, at a meeting in November 1958. had discussed a proposed reroute of the Hillhall Road. The new route was planned to go through the garden of Dr David Warden at Drumbeg. In the minutes from the meeting it was stated that the board were not satisfied that the proposal represented the only practical method of the construction of the road. The committee had decided that the county surveyor would have been asked to comment on the proposals from the point of view of the road authority before the Health Board had dismissed the idea completely. LISBURN people were among blood donors from all over Northern Ireland invited to a garden party in July 1958 by Governor and Lady Wakehurst in Hillsborough. 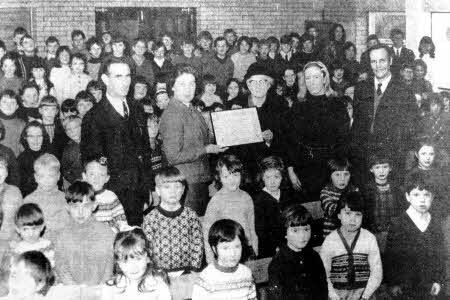 Over 1.000 Lisburn men and women who gave blood since the service was started in 1948 had attended and 30 members were given silver badges for donating blood over 30 times. The visitors were entertained by music from the band of the Royal Ulster Constabulary.